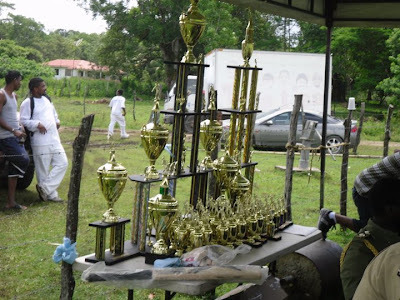 Belize National Cricket Association's (BNCA) president Elston Wade had the official table set with an array of trophies, medals and awards to be issued to the winners and special awardees for the recently completed 2010 SMART Harrison Parks National Cricket Competition. 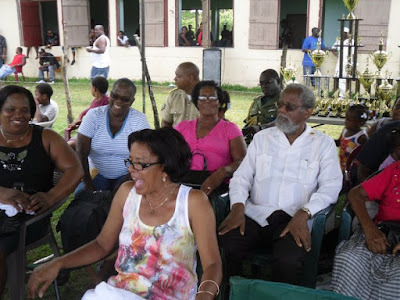 Despite the premature departure of the guest of honor; His Excellency the Governor General, Sir Colville Young, due to some disorderly conduct, the trophy ceremony went on as planned. Huge man-sized trophies were received by the champions, Surprise of Lemonal, and the sub-champions, Excellence of Double Head Cabbage. Individual trophies were also awarded to members of these two teams, although the Excellence captain collected those to distribute later in Double Head. Also, since the first round of the competition had two divisions, team trophies were awarded to the Group A champion (Surprise) and sub-champion (Brilliant of Crooked Tree), and to the Group B champion (Excellence) and sub-champions (Wicked Eleven of Flowers Bank). Special guest speaker for the occasion Sports Director Anthony Michael issued a Spirit of Cricket team award, $500.00 check to the Surprise team for for its demonstration of sportsmanship. He also promised to increase this award to $1000.00 in the upcoming 2011 competition, as well he promised another $1000.00 for the Best Sportsman of the tournament in 2011. In recognition of its centenary celebration last year (1909-2009), the ICC had assigned five ICC, International Cricket Council Centenary Medals to be distributed to by the BNCA. None of the selected individuals were present (only the G. G. was there earlier but had to leave before the ceremony); and the medals were received in their behalf for: Telford Vernon by his son Trevor Vernon; for CHARLES ADOLPHUS, by the Brilliant team captain; and for umpire Norman Bennett, Ms. Virge Flowers and Sir Colville Young by BNCA president Elston Wade. 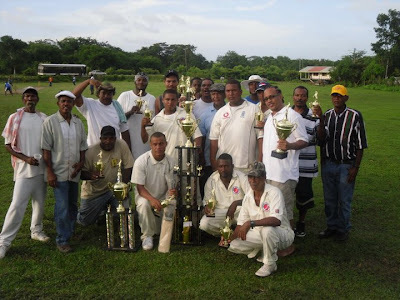 The tournament MVP trophy went to 17 year old Surprise player Herbert Banner, and he was also presented with a bat and tips set, valued at close to $1000.00 , by resident ICC umpire Calbert "Cally" Banner. Mrs. Margaret Hendy presented the Vallan Hendy Spirit of Cricket Trophy for sportsmanship to 14 year old Keenan Flowers of the Excellence team. The vote of thanks to end the ceremony was given by Mrs Gayle Thompson. 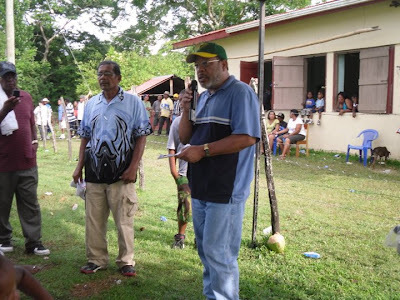 There were two 20/20 matches played, the start of a knockout competition, during the course of the day, and we await the report on those from the BNCA. Reprinted from the AMANDALA newspaper of Sunday, August 29th, 2010.